Kraftwerks is pleased to announce the release of a brand new intercooled supercharger system for the new Subaru BRZ and Scion FR-S. At the heart of the new system is a Rotrex supercharger, either the C30-94 or the C38-81. Rotrex superchargers are renowned for their compact size, high adiabatic efficiency, low vibration, and quiet operation. Their unique traction drive technology is what makes all of this possible, which, unlike other superchargers, transmits power through frictional forces between its rolling elements. Each Rotrex unit features its own self-contained oiling system that remains independent of the engine. Its dual-action oil pump supplies traction fluid to the supercharger while the supplied cooler ensures proper fluid temperatures at all times. Rotrex superchargers also operate much cooler when compared to turbochargers and other supercharger systems, which reduces the engine’s intake air temperature as well as its risk of detonation. All Kraftwerks supercharger systems provides instant throttle response and a progressive power curve that increases all the way to redline without the typical ‘spiking’ or ‘surging’ associated with turbochargers. This unique, more useable power curve results in reduced cylinder pressures, less strain on engine components, and increased reliability. Kraftwerks supercharger systems are available for a wide variety of vehicles and are designed to deliver broad, usable power gains – ideal for street cars and track cars alike. 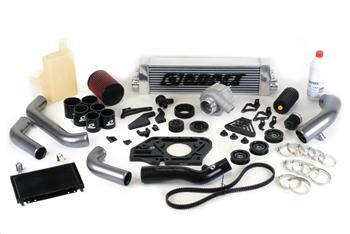 No other supercharger kit or turbocharger system can compare. Kraftwerks supercharger kits represent the pinnacle of forced induction, having demonstrated gains in excess of 100% across the entire power band on a number of applications. At 9psi of boost pressure, the Kraftwerks supercharger system produced an impressive +90whp on 91-octane through the OEM headers and exhaust, and +125whp on E85 through Skunk2 headers and exhaust. More impressive is the linear power curve throughout the entire power band due to the patented traction drive technology, which transmits power through friction forces between its rolling elements.